04. The New Peterson Nomenclature Stamping. Last summer when I interviewed Tom Palmer I noticed, laying on his desk, an unfinished stummel with a peculiar-looking nomenclature stamp. 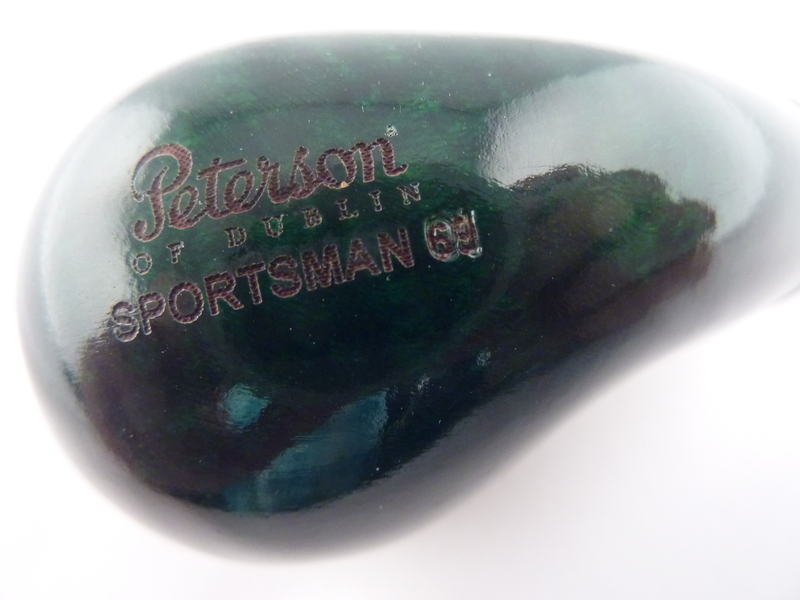 Picking it up, I was amazed: there, in a perfectly-stamped, deep impression, was the “Peterson of Dublin” logo. It was black and looked like it had been burned into the wood. Seeing my curiosity, he told me it was made by a laser, and that Peterson was considering using it to replace hand-stamping for COMs and nomenclature. At first I thought the laser-stamp sample bowl I saw on Tom’s desk seemed a little deeper and darker than this one, but the macro photography convinced me they’re the same. As you can see, the typography of the laser-burned stamp is a little deeper, narrower and sharper than what can be had with a traditional steel-impressed stamp. 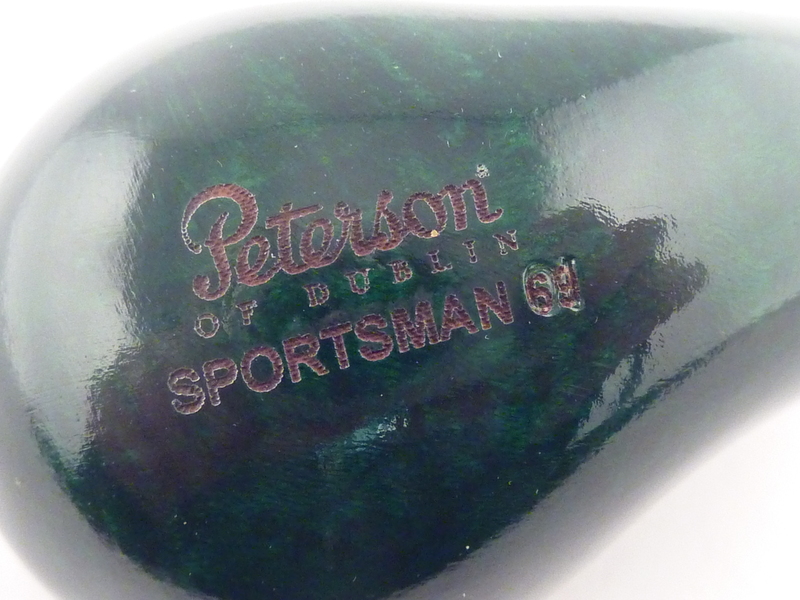 If you look closely at the various photos, you can see the laser-burned “68” below the hand-pressed “01”—the 68 is one of the shapes earmarked for the Sportsman series. Everyone’s going to have his own opinion on whether hand-pressed stamps done the traditional way are better than laser stamps, and rather than give you mine, I’ll just lay out some of the pros and cons I expect we’ll be hearing. Let’s begin with Motto of the Luddite Faction (of which in many ways I’m a card-carrying member): “The old ways are the best ways.” Certainly they’re the ways we’ve known, and as you can see in my “Irish Whisky” photograph of K&P stamps (which will be in the forthcoming book), those nomenclature and COM stamps aren’t just pieces of steel, they’re history incarnate. 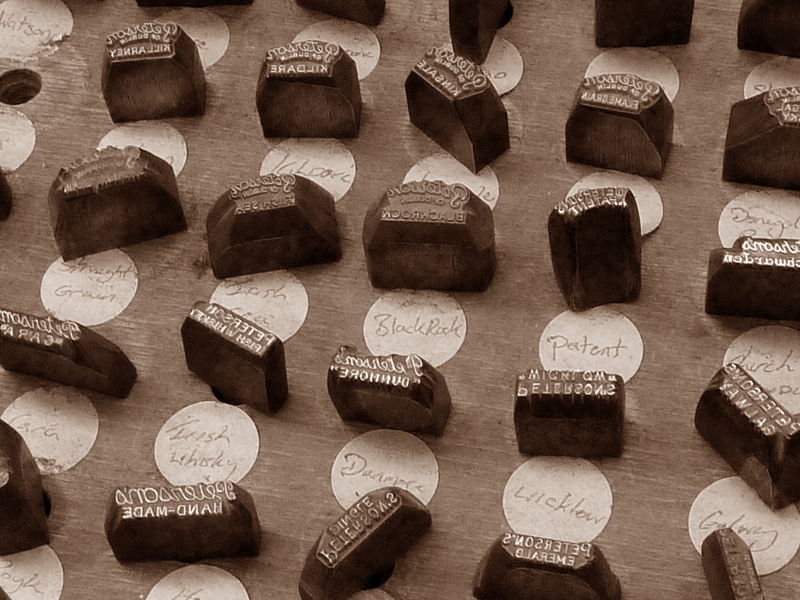 If you own any of the pipes stamped with one of those depicted, you’re connected to Peterson of Dublin and the men and women who made your pipe in a very concrete and particular way—each stamp has marked thousands upon thousands of pipes. A laser-burning machine, of course, is just another piece of electronic hardware. Here today, obsolete tomorrow. How frustrating is it to get a new or vintage Pete and the nomenclature is double or treble-stamped? You might have a beautiful piece of briar and you look at the stamp and think, “WTF? Have I had one too many tonight?” Then you remind yourself that stamping is done by hand, using a kind of vice with a leather saddle for the stummel, a bit of a tricky business when the object being stamping isn’t flat. So you breathe in and breathe out and remind yourself that you’re a lucky dog to have this new Pete in the first place. Sometimes part of the stamping is illegible and part of a number or letter has gone missing, edging out over the smooth area of a rusticated or sandblast pipe or rolling off into space on a smooth one. On some Pre-Republic pipes it sometimes seems that the pipe wasn’t stamped very deeply in the first place. Fourth—and this is just speculation—I sometimes wonder if extreme heat or humidity over time has lifted the impression of the stamp (just like we do when we restore an old pipe’s dents by placing a heated knife over a wet piece of cloth on the dent to lift it). The stamp’s been all but erased by overzealous or unmindful buffing when the pipe was cleaned or restored. I won’t deny it’s exciting when I first get an estate Peterson to get out the loupe and take a look at the stamping. But when I’m restoring the same pipe, it’s a little harrowing to realize that I’m sanding over a vital piece of information in order to save the rest of the pipe. No matter how easy I take it, there’s always a little bit lost. I’m going to skip over the mantra of Digital Natives (“Change is inevitable. Change is good. Change is our friend.”) and go right to the possible advantages of laser-stamping. For K&P, I’m assuming it must be less expensive than hand-stamping. Those guys work pretty hard for their money, and I can relate to that. I know this is never a consideration for guys who collect S. Bang, Tom Eltang and other hi-dollar artisan pipes, but I think one of the reasons some pipemen like Peterson pipes is that they know Petes are made in the same universe as the one they inhabit, where every dollar counts and you’re grateful when each paycheck arrives and the water, gas and electric are still running at the casa. A second advantage—and one Tom Palmer mentioned when we talked about it last year—is that this type of stamping is more impervious to the perils of time and buffing. I know he was likewise concerned about the diminishing size of the hallmark letters on sterling-mounted pipes, which as you recall got so small for a couple of years that they were illegible even under a loupe. He got the Assay Office to correct that, as you can see on this and last year’s hallmarked pipes. But if part of the purpose of the laser-stamping is to help the collector identify a pipe, then I’d like to ask (and will ask) Peterson if it would put a year stamp or year code on all unhallmarked pipes. That would be a huge boon for every Peterson collector and fantastically fun. To pick up any standard production pipe and know the exact year it was cut—how cool would that be? Next Post05. 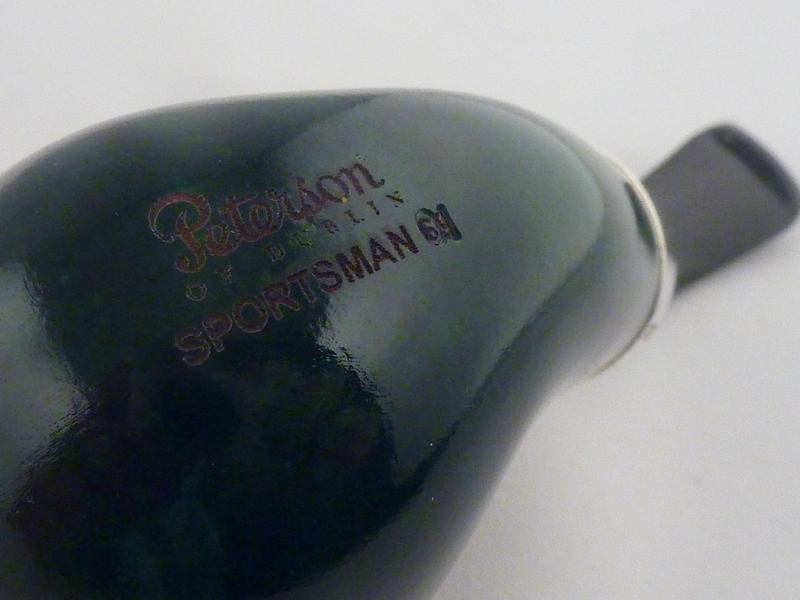 The New Sportsman Line. 05. The New Sportsman Line.